Piatra Craiului National Park is located near Brasov in Romania. Rare species: Dianthus callizonus, Hesperis nivea, Minuatia transilvanica, Leontopodium alpinum. The Garofiţa Pietrei Craiului (Dianthus callizonus) is a beautiful purple flower only found in Piatra Craiului. It is protected as is the Edelweis growing on the high slopes. Access points are: Zarnesti (easy to reach from Brasov), Dambovicioara, Bran (Inima Reginei, Magura village), Moeciu, Fundata and Sirnea. Busses from Brasov to Cumpulung or Pitesti and back stop in Podul Dimbovitei. Travel further into the valleys with a minibus, with one of the 'Bucuresteni' (from Bucarest, number plate starts with 'B') that own houses there or try one of the trucks going for timber or coming back fully loaded. All tracks are marked very well with different color codings. Recently (2011) a lot of signs have been renewed. Some tracks high on the mountains are very steep. Steel cables are attached to the walls. One track is even called "Lanturi" meaning "chaines". 7 cables can be found here. The old chains have been replaced by steel cables which usually are in reasonable to good condition. The vallyes to the north (Zarnesti and Plaiul Foii ) and east of Piatra Craiului (Dambovicioara) are in weekends more crowded than the valley in the west from Podul Dambovitei to Satic and lake Pecineagu. During the week it is quiet everywhere. A brand new very steep road starts from Dambovicioara going up to Ciocanu and Sirna eventually reaching the main road to Brasov. It has been build with European funds and should contribute to tourism in the region. It offers a very beautiful view on the Piatra Craiului. Visitors center near Plaiul Foii, 1km from Zarnesti. Hotels, private pensions ("Cazare") and campings can be found anywhere around Piatra Craiului. Mountain huts (Cabana) can be found near the base of the mountains. Take your own sleeping bag and food with you. There is often no restaurant but a kitchen is available for your own cooking. Ordinary Romanians usually use the cabana for barbecue parties until late in the night. Especially in weekends and on new years eve. Be prepared for some noise. At the other hand you are invited quickly to join the party. Do not forget to bring some wine and Tuica. On the ridge itself there are some half dome like shelters. One near the summit "La Om". Many times people camp outside the shelters, even on the ridge, as the shelters can be crowded and some times are not that clean. There are bears in this national park. Do not camp in the wild especially in spring when the bears have cubs. When approaching sheep flocks call for the shepherd as soon as possible to prevent being attacked by Carpathian Shepherd Dogs guarding the herd. Always carry a stick for protection and some stones in the pocket. Shepherd know their dogs and usually react quickly. Better is to circumvent the flock. Especially in spring wild pigs will attack when accompanied by small ones and suddenly encountered. Be careful on open fields. Get into a tree when being attacked. By the way: normally they will get away when people are approaching. As do bears. Making some noise when walking could be a good idea. Do not walk in the forest during the night. Be aware for thunderstorms on the ridge. Lightning strikes often here and there are not many ways to descent. 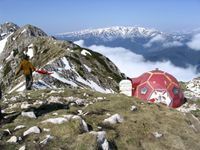 The shelters on the Piatra Craiului ridge are said to be save when trapped on the ridge in lightning. One shelter is near the summit "la Om" on the ridge. Take enough water from the few springs at the foot of the mountain before ascending. No water can be found on the ridge and the way is long. Ask locals for locations of springs. On some trails they can hardly be found. This page was last edited on 9 May 2014, at 15:06.